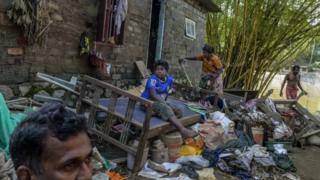 The flood-hit south Indian state of Kerala has declared a health alert after 11 people died of leptospirosis or rat fever in the last two days. The government has asked everyone who came into contact with flood waters to take medication as a precautionary measure to avoid an epidemic. Health officials in the state said there was no immediate cause for alarm and the situation was under control. Devastating flooding has killed around 400 people in Kerala since June. More than a million others were displaced, with many of them taking shelter in thousands of relief camps across the state. Doctors said that the outbreak had not come as a surprise and they were prepared to deal with it. "After the floods, we were expecting to see water-borne diseases like cholera, typhoid, diarrhoea, hepatitis and rat fever," Dr Iqbal Babukunju, a senior government health official, told BBC Hindi's Imran Qureshi. "People have just started going back to their homes from the relief camps. In many homes that have been chlorinated, water had not receded. This was inevitable," he added. So far the illness has been detected in five of the 13 districts that were hit by flooding. "All the hospitals are well equipped with penicillin as well. Guidelines have also been issued to private hospitals on how to treat patients with rat fever," Dr Saritha R, the director of health services in Kerala, said. Leptospriosis (also called Weil's disease) is spread through rats or animal fluids, and can enter the human body through small cuts in the skin or through the eyes, nose and mouth. It is caused by the leptospiro bacteria. Symptoms include fever, nausea, muscle aches, vomiting, and diarrhoea. "Rats drown in flood water which contaminates it further, allowing the leptospiro bacteria to enter the human body through the skin," said Dr V Ravi, a professor of virology at India's National Institute of Mental Health and Neuro sciences.